Hi, my name is John Sarkissian. I am an Operations Scientist at the CSIRO Parkes Radio Observatory. My main responsibilities are the operation and systems development at the radio telescope, and the support of visiting astronomers with their observations. In addition, I am involved in Pulsar research - an exciting field of radio astronomy - as well as numerous outreach and public relations activities of the CSIRO's ATNF. Click here for details of all of my scientific papers. Click here for details of all of my Parkes Projects. Since 2004 I have been a member of the Parkes Pulsar Timing Array (PPTA) team under the leadership of Federation Fellow, Dr Richard Manchester. The PPTA is in effect a gravitational wave detector using the Earth as a test mass. By making precision timing observations of an array of pulsars distributed on the sky, we can investigate the stability of terrestrial clocks and improve our understanding of Solar-system dynamics. We also have the exciting possibility of making the first direct detection of gravitational waves. In addition, I am a member of several other pulsar research teams, regularly supporting pulsar observations at Parkes. I am a member of a small, informal team searching for the missing Apollo 11 SSTV Tapes. I've been searching for these tapes since the late 1990's. In May 2006, I produced a report detailing our efforts to date. This report led to NASA initiating a formal search headed by the Deputy Director of the GSFC, Dolly Perkins. The report on the formal NASA search was released on 4 November 2009. More on the 16 July 2009 release of the initial results can be found here. The DVD of the restored Apollo 11 video can be obtained from JAmml Media. In May 2007, I was invited to become a member of an Advisory Group that will help to formulate Australia's activities for the International Year of Astronomy (IYA) in 2009. This Advisory Group was a working group of the National Committee of Astronomy, under the auspices of the Australian Academy of Science. Between 1998 and 2000, I provided research material for, and was a technical advisor on, the feature film "THE DISH". I was also the telescope operator for the film and I extensively liaised between the Working Dog production team and the Observatory staff. It's been a great privilege for me to be associated with this film. Click here to see my report "On Eagle's Wings", about the Parkes Observatory's support of the Apollo 11 mission. I originally came to Parkes in 1996 to support the Galileo Mission to Jupiter. I managed the Galileo spacecraft tracking operations at the observatory and I performed 1/3 of the daily tracking duties. It was a privilege for me to be associated with the Project. I have a Bachelor of Applied Science (in Physics) degree from the University of Technology, Sydney. Since the age of 10, I've had a passionate interest in astronomy, and have worked at several observatories throughout the world. In 1991-92, I was a Research Assistant at the Byurakan Astrophysical Observatory, Armenia, where I studied a variety of topics which included Active Galactic Nuclei and the Dynamics of Galactic Clusters. From 1990-91 I was a scientific programmer at the Anglo-Australian Observatory where I worked on upgrading the "FIGARO" data reduction software. From 1988 to 1996, I was a Guide/Lecturer and Education Officer at Sydney Observatory. 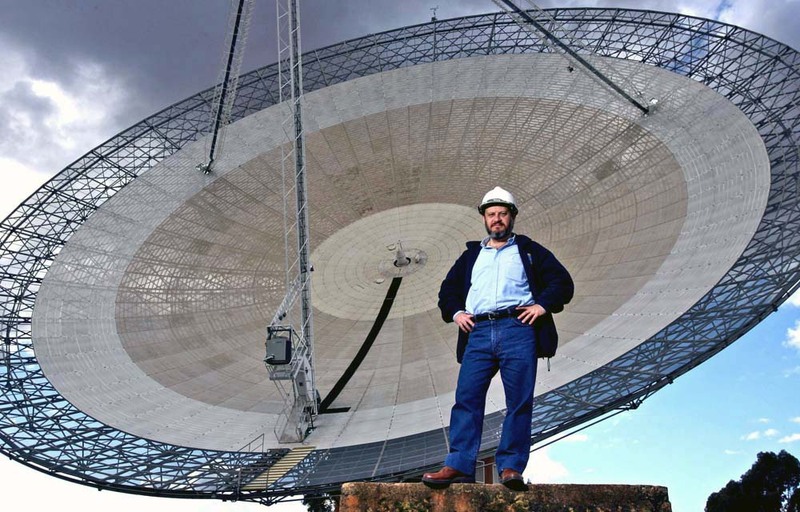 From 1993-95 I studied VLBI techniques at the Australia Telescope National Facility in Sydney. I am also a member of numerous astronomical societies. I was the Founder and first President of the Sydney University Astronomical Society, 1982. I was the Founder and President of the Endeavour Astronautical Society, 1985-90. I was a founding member of the Australian Space Policy Institute, 1989. I am a founding member and first President of the Central West Astronomical Society, 2002-2008. From 1985-87 I was an Associate Systems Engineer with IBM Australia, where I worked on the launch of the RT-PC Engineering/Scientific workstation at IBM's Asia/Pacific Headquarters at Cumberland Forest, Sydney. My hobbies include learning to fly, satellite watching, bushwalking, camping, snorkelling and photography - both normal and stereo photography. I am currently a member of the Sydney Stereo Camera Club. From 1992-96, I worked as a professional photographer with the Happy Medium Photo Co. (a great case of one's hobby being one's work). My period of study at the Byurakan Astrophysical Observatory in Armenia, coincided with the collapse of the Soviet Union. I was present in the country during the August 1991 coup attempt and also during the Independence Referendum (held a month later), which resulted in the independence of the Republic of Armenia. I was also present, and witness to, the dissolution of the Soviet Union on 25 December 1991.